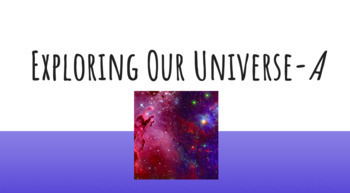 This bundle contains resources specific to all aspects of a middle-school astronomy unit. It is divided into 9 different subunits, all of which I was able to complete in about two months of instructional time. There are 6 quizzes (with keys) that cover all 9 subunit topics, 9 PowerPoint slides each with accompanying fill-in-the-blank student note guides, and 9 vocabulary slideshows. Each note guide ranges between 1-4 pages in length depending on the subunit. Also, there are relevant video clips built into the PowerPoint slides to accompany the note guides. 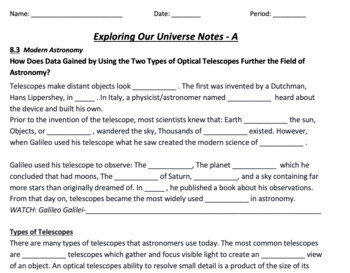 There is a place on the note guide for students to write down a fact, comment, or question such as something that stood out to them while they were watching the video clip. 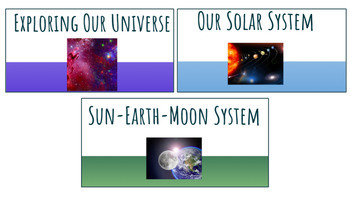 Many of the video clips have been embedded into the slide itself usually from Discovery Education, but some are located on BrainPop directly and the text is hyperlinked. 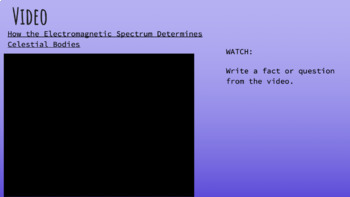 Same goes for the vocabulary slides, there are videos hyperlinked to the text "Watch" at the bottom right of some slides. I use these videos to break up the monotony of taking notes plus they give relevant insight into key terms before we dive deep into each subunit with the note guides. They are there in case you need to use up some instructional time one day. I spent many hours creating all of these materials this school year and successfully used them within my own classroom. I hope you are able to find these as useful as I have this school year and for many more to come!